I am in the midst of a series examining the relative strengths and weaknesses of the teams in the AL East, on a position-by-position basis. The players at each position are being ranked in relation to their peers within the division, with each team being assigned points based on where their player ranks in comparison to the other players. 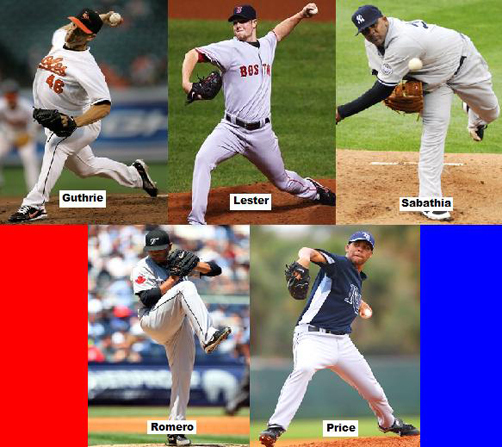 Today, the series continues with a look at the staff aces on each of the starting rotations. At the end of the process, I will accumulate all of the points for each team and create a divisional power ranking. Here are the 2010 statistics for each of the five projected starters entering the 2011 season. The chart presents the five basic stats used in fantasy baseball, plus OPS+ and Runs Above Replacement (RAR). The rankings contained herein are based on these stats, plus projections as to what the upcoming year may have in store. While Lester and Price are outstanding pitchers in their own right, Sabathia has performed at an elite level for years. Until Sabathiaâ€™s skill sets diminish or one of the others strings together a couple more dominant seasons, CC gets the nod. Sabathia has been remarkably consistent. He hasnâ€™t posted an ERA above 3.27 since 2005, and he hasnâ€™t pitched fewer than 230 innings since 2006. He is a true â€œaceâ€ in every sense of the word and has, thus far, earned every penny of his lucrative contract with the Yankees. While he struggled against left-handers last year, that anomaly can be explained by a 36% hit rate for lefties. You can expect that metric to progress towards the high-20s or low-30s. His other metrics demonstrate there is no reduction in his overall skills. For fantasy owners: I have said for the last couple of years that the combination of his size and excessive workload could lead to him breaking down (physically). Not only hasnâ€™t that happened, but he has flourished. Looking ahead, he reportedly came into camp this spring 15-20 pounds lighter than last year â€“ making a physical breakdown less likely. As much as it pains me to say it, I expect he will have another Cy Young caliber campaign in 2011. In picking between Lester and Price, the basis of the selection was Lesterâ€™s longevity and not a differential in the skill set of the two pitchers â€“ they are largely indistinguishable pitchers from a statistical standpoint. Lesterâ€™s ERA is a bit higher, but he strikes out more batters. Lesterâ€™s xERA last year was 2.89, while Priceâ€™s was 3.62 â€“ thus the realized statistics are a bit misleading. Lesterâ€™s command (2.7), dominance (9.7) and strand rate (74%) all predict growth at a rate higher than that of Price. Additionally, Lester has continued to enhance his ability to induce ground balls, and I have yet to see a ground ball home run. In the last four years, he has posted ground ball rates of 34%, 47%, 48% and 54%. If he can hold onto last yearâ€™s GB-rate, he could soon challenge for a Cy Young Award of his own. For fantasy owners: Prior to last year, Lester had a tendency to get off to a slow start but heat up as the year went on, but last season was different: he posted a 2.76 ERA before the all-star game and a 3.83 ERA afterwards. I suspect he will not repeat those second-half struggles in 2011, so I am looking forward to 21 wins and a sub-3.00 ERA for the season. It is remarkable that someone as good as Price is no better than No. 3 in his own division, but that is life in the AL East. Price has outstanding skills, but his metrics indicate that much of his success last year was due to good fortune. He has consistently posted hit-rates in the high-20s (28% in 2010) early in his career, so that may be the norm for him and should not serve to discount his skills in any analysis. But his strand rate (79%) is ridiculously highâ€¦ and that fact is reflected in his xERA (which is almost a run higher than his actual number). He improved his ground ball rate (to 44%) last year, but his fly ball rate also increased (to 40%). It would be nice to see him induce more ground balls. For fantasy owners: Other than the caveats discussed above, his skills are very solid and suggests a 16-17 win season with a somewhat diminished Tampa Bay squad around him. He will be the staff ace for years to come, but invest based on 16 wins and a 3.50 ERA, not the 19 wins and 2.72 ERA he managed last year. He is unlikely to repeat those numbers. At 6â€™0â€, 210 lbs, stamina should not be an issue for Romero â€“ but it seems to have plagues him in each of his first two big leagues campaigns. He has been very solid in the first half and somewhat less so in the second half of the last two season. In each year, he seemed to hit the wall in July and fall apart in August and September â€“ though last year he had a better second-half than in 2009. That said, his peripheral stats indicate a string skill setâ€¦ the issue will be how to maintain those skills for a full six months. He has an excellent ground ball rate (55%), hit rate (29%) and strand rate (72%) â€“ all of which appear to be largely sustainable. His command (2.1) could use improvement if he is to develop into a true staff ace (NOTE: It should be at 2.5+â€¦ since his K-rate seems to be what it is, he will have to reduce his strikeouts to achieve that plateau). For fantasy owners: His xERA last year was 3.32, so there is room for some growth â€“ assuming he gets the stamina issue resolved. I donâ€™t see his numbers getting much better than last year, but 16 wins and a 3.50 ERA would appear to be within his reach. Hmmm. Guthrie had an excellent 2008 followed by a disastrous 2009 followed by an excellent 2010. I wonder what is in store for him in 2011. In fairness, he also had a solid 2007 campaign, making his ugly 2009 season appear to be an outlier. He has posted sub-30 hit rates in each of the last four years, and it seems likely his struggles in 2009 can be explained by a low strand rate (of only 69%). For fantasy owners: Donâ€™t get too excited by his second-half performance last year â€“ it was driven by an unsustainable hit rate (25%) and strand rate (77%). You can expect he will win 11 or 12 games, and post an ERA in the vicinity of 3.75 â€“ but that is what he will do as long as he is facing the lineups in the AL East. Despite the fact that based on last year’s stats they would rank Price-Sabathia-Lester-Romero-Guthrie, I ranked them in the same order as you, valuing the proven ability of Sabathia and Lester over Price…at least for now. I am inclined to give the edge to Jon Lester. Even though CC has lost some weight over the Winter and appears to be on good shape, he has also logged a lot of innings. Lester is just getting started.